What Toronto pub do you watch your football in? The great thing about Toronto is that you can put on your football scarf, wander into a pub on game day and mix with other football fans. You can also get out alive, which is a nice, respectable way to enjoy the game these days. I had a quick look at the Brits in Toronto football page and — although chuffed that we have just over 50% of the English Premier League represented — still want to complete the full tally. 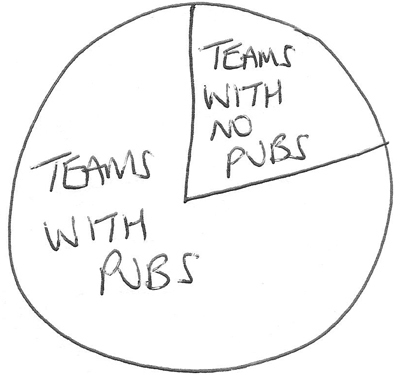 So, if you know which Toronto pubs fans of the following teams watch their matches at, drop us a quick line. Much appreciated. *Illustration copyright Brits in Toronto 2013. All rights reserved. Unlawful copying or reproduction of the data is strictly prohibited. This entry was posted in Uncategorized and tagged brits in toronto, football, pubs on October 29, 2013 by britsintoronto.